Bernie Sanders and Hillary Clinton continue to escalate their feud as the two campaigns move to the northeast for an emotional battle over New York. After tepid attacks on Sanders, Clinton has gone on the defensive. Her press secretary, Brian Fallon, told MSNBC that the Sanders campaign “needs to take a timeout,” and Clinton expressed puzzlement at Sanders’ attacks saying that she would prefer Sanders to either of the leading Republicans. I don’t know why he’s saying that, but I will take Bernie Sanders over Donald Trump or Ted Cruz anytime. “I don’t know why he’s saying that, but I will take Bernie Sanders over Donald Trump or Ted Cruz anytime,” she said outside of Yankee Stadium in the Bronx. The backlash to Sanders’s attacks were trending on social media with the hashtag, #HillarySoQualified. It started with Clinton’s interview on MSNBC’s Morning Joe where she questioned Sanders’ knowledge of core issues in his campaign. “Well, I think the interview raised a lot of really serious questions,” said Clinton referring to the New York Daily News interview with Sanders. I don’t think you are qualified if you get $15 million from Wall Street through your super PAC. Sanders responded by questioning Clinton’s qualifications to be president at a rally in Philadelphia. Clinton also attacked Sanders for his position on gun laws, linking it to the Sandy Hook Elementary shootings, and her campaign calling for an apology. This came after a daughter of the principal who was killed in the shooting criticized Sanders for his position. Sanders responded, saying that Clinton should be the one apologizing. 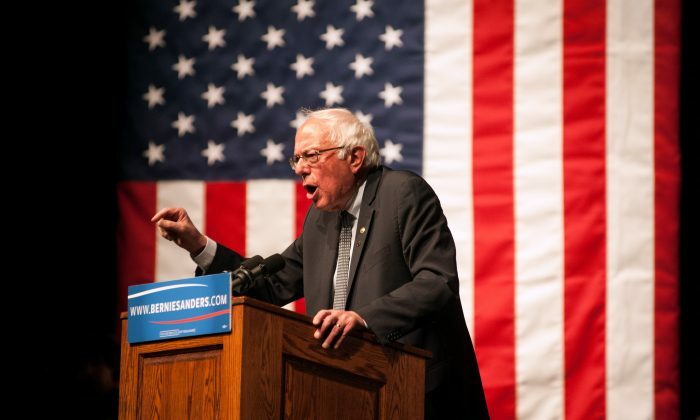 The tension between the two campaigns follows a decisive win for Sanders in Wisconsin, and comes a little less than two weeks before the important New York primary on the 19th.